Lucuma is a subtropical fruit native to the Andean valleys of Peru, where it is known as the “Gold of the Incas”. It has a sweet caramel/butterscotch flavour and a creamy texture. Its low glycemic index makes it an ideal choice for sweetening dishes if you are trying to reduce your sugar intake. It is primarily used in Peru for flavouring and is in fact the region’s most popular ice cream flavour. Lucuma powder is produced with minimal processing. Once picked the fruit flesh is simply dried at a low temperature and then milled into powder. 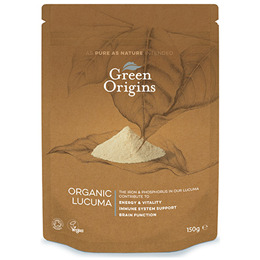 Lucuma is a source of Phosphorus, which helps to maintain strong bones and teeth. Organic raw Lucuma powder from Peru. Take 1-2 teaspoons per day, mixed with juice or a smoothie. Lucuma can also be used to add flavour to savoury and sweet dishes. 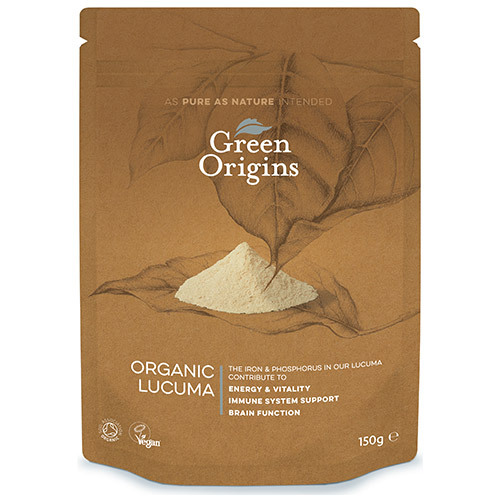 Below are reviews of Green Origins Organic Lucuma Powder - 150g by bodykind customers. If you have tried this product we'd love to hear what you think so please leave a review.